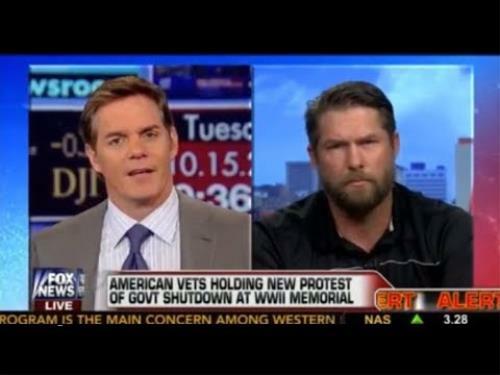 Former-Navy SEAL Ben Smith spoke recently at the World War II Memorial alongside other American veterans, following that event, he dropped a bombshell on Fox News (the majority of us have already been thinking what Smith said) and claimed that the US government is creating conditions that are necessary to impose martial law in the United States. Smith told Fox host Bill Hemmer what many of us have been suspicious of all along under Barack Obama; that the federal government is looking for means of creating an atmosphere for implementing martial law. The former Navy SEAL told Fox that he believed that the federal government was attempting to provoke the veterans to "do something." When asked what he meant by that, Smith said, "That's not just my statement," he said. "Within the (perspective) of people who see things wrong here, who are looking at the shutdown, this can be absolutely planned, and it's a conversation topic." "They want us to do something," he continued. "They either want to diminish our voice or our significance, or draw contact, and they can crush us." Smith went on to name names. "You've got Sheila Jackson Lee, who is calling for martial law to end the shutdown," he said. "That's insane. That's getting rid of the Constitution of the United States, which is also what every service member has signed up to and including their life for: To protect and defend the Constitution of the United States, both foreign and domestic." Smith went on to elaborate on the government creating the conditions. He pointed out the attacks on the Second Amendment, specifically pointing out the gun grab of veterans, especially those with PTSD (Post Traumatic Stress Disorder). The attacks on veterans in the last election concerning voting rights and getting ballots back from overseas were also made mention of. "They want to discredit the military," Smith added, "and get us to do something stupid so that they can lock us down, get rid of….you can call it a conservative Tea Party movement, it's more people that believe in the foundations of this country are the people that they are poking at, which are the citizens of this country." 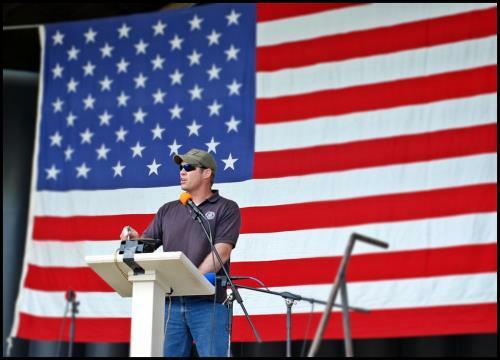 Ben Smith believes that both sides in Washington view the American citizen and service members as a "political wargame," a "cold civil war," in which they are vying for votes. It appears that Smith is saying that we are nothing more than a means to their end of gaining or keeping power. I agree with that assessment. Few in Washington are there to serve, but rather to be served. "The Right isn't the Right anymore," Smith continued. "There's no real political figures that believe in the Constitution." While Mr. Smith did say that there was a handful of elected officials he would trust, he believes the majority are simply using the American people. Smith also said that those that participated in the protests were not paid to be there, drunk, using profanity, or being vulgar. Those involved are simply decent people that want to live in freedom and not be trampled upon by those they elected to serve them. Ben Smith served in Iraq in 2005 and 2006. He also provided some of the security at the World War II Memorial as the crowds gathered to protest. Well done Mr. Smith, and thank you for your service!